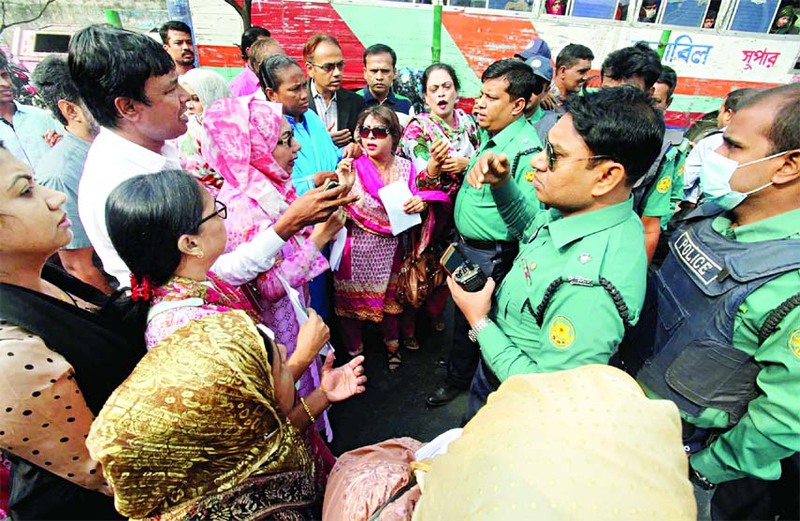 The campaign convoy of BNP's Dhaka-9 seat candidate Afroza Abbas reportedly came under attack twice at Kamalapur and Madartek in the city by ruling party followers on Wednesday, leaving five people injured. A group of ruling party activists, led by local Awami League leader Chittaranjan Das and Chhatra League leader Shahrira, equipped with rods and sticks attacked the motorcade of Afroza Abbas at Madartek around 12pm, said her media coordinator Nahid Nazrul. He said the Awami League workers damaged a vehicle of Afroza and assaulted her driver Abdur Rashid. Thy also beat up four BNP activists as they tried to rescue Rashid, Nahid added. He said Rashid was admitted to Al-Baraka Hospital in a critical condition. Earlier, Nahid said the same group attacked Afroza Abbas and her followers near Kamalapur Boys' High School around 10am when they were carrying out election campaign there. He claimed the attackers also assaulted some female activists of Afroza. Meanwhile, Mirza Abbas, husband of Afroza and BNP's candidate for Dhaka-8 constituency, warned that he has the strength to put up resistance against any attack on him. Talking to reporters while conducting campaign in Motijheel area, he said, "I've heard around 100 Awami League cadres with sticks are waiting for me to be at Paribagh. I would like to tell BNP activists that I've the strength to resist any such attack." Abbas said his wife's election campaign came under repeated attacks since morning. "She didn't engage in fight. I also don't want to lock into any clash as we're on election campaign to woo and inspire voters." The BNP leader also said police are not taking any step to resist the attackers as they are only playing the role of silent spectators.